Our 10 Series of drop deck trailers are ideal for those customers who want a higher deck because of the terrain. If you are frequently operating the trailer in areas where the underbrush is high, or if you are on mountainous roads and hills with sharp dips. The 10 Series is ideally suited with a 4” higher deck and higher ground clearance. This series also features a wider deck – 82” between the fenders and the deck is flush with the outside frame. The flush frame makes it easier loading palletized material or to allow for large or odd shaped cargo to extend over the edge of the flush deck. Using heavy duty drop axles helps keep the deck in a lower position and we add 5’ ramps to accommodate loading operations. 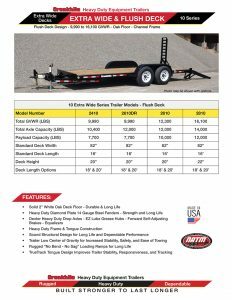 The 10 series is available in all the popular axle configurations to handle a wide variety of construction equipment and features 2” solid hardwood oak deck floors, heavy duty diamond plate fenders, step-tongue design that accommodates a wider variety of hitch heights, electrical wiring is encased in steel conduit for added weather and road debris protection, and LED lights. Click the image to view specifications in pdf.